Here's an example of a real cipher used by the British in the American Revolution. In August of 1777, British General Clinton wanted to let his commander, General Burgoyne, know whether he could answer the call for reinforcements. He also used the message to comment on the movements of American General George Washington (Sir W). 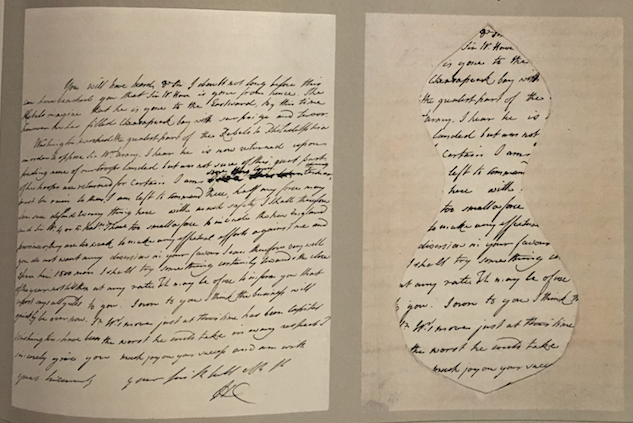 The idea of the cipher was to write a seemingly mundane letter, whose meaning could only be understood by the reader using a cut out on a separate sheet of paper, that was previously agreed upon. In this case the key was in the shape of an hourglass. Apparently, General Burgoyne lost his copy of the mask and had to recreate it by memory. "Sir W. Howe is gone to the Chesapeake bay with the greatest part of the Army. I hear he is landed but am not certain. I am left to command here with too small a force to make any effectual diversion in your favor. I shall try something at any rate. It may be of use to you. I own to you I think Sir W's move just at this time the worst he could take."